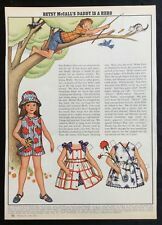 From the McCalls magazine here's an uncut Betsy McCall paperdoll. This is "Betsy McCall Makes an Apple Doll" from May 1972. This page is in very good condition with just a small edge gouge. I have many of these pages listed. 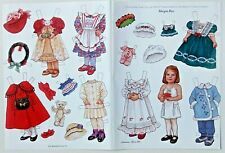 This is the NURSE and DOCTOR paper doll book. It was published by Saalfield in 1952. 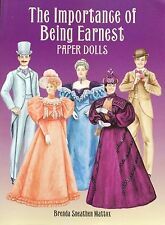 The paper doll artist was Betty Campbell, as identified on the cover. COMPLETE and NOT a REPRODUCTION. NURSE and DOCTOR. Saalfield / Artcraft. Pink scissors are inside the clear plastic bag. The pages may be a folded sheet or book-like. There is a hole located in the middle of the top cover (the plastic cover also has a hole in it). Hallmark Doll Card This Adorable Greeting Card is dated 1947 *Hallmark Doll Cards*. It is Doll No. 3 in the Series *Land of Make Believe* ....... "Mary Mary Quite Contrary". Very Good Condition with it's feather and sequin intact and inside is clean. Winning bid pays 1.95 p/h. More outside the US. I will combine wins to save you on postage. Thanks for looking. 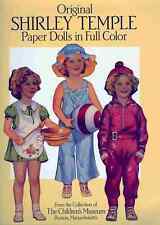 THE GINGHAMS 4 Paper Dolls 1976 Whitman MINT/UNCUT - no stickers or marks! This may be the first issuing date for these darling dolls that everyone loves. THIS IS A ORIGINAL UNCUT BOOK. IT IS A SOFT COVER BOOK. THE WHOLE BOOK IS SHOWN. I will find out for you. We will do our best to solve your problems! (2) Dolls from Storyland 7 dolls & 6pgs clothes. 1) Polly & her playmates 4 dolls wrap-around dresses & 6pgs clothes. These are reproductions of 1950s (40s?). Dolls punch out from covers, clothes are cut-outs. 6 dolls (One on the back cover is beginning to detach) Jack, Susan, Ann, Dickie, Bob, Betty. 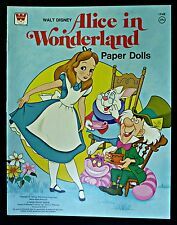 Wonderful paper dolls twins a boy and a girl call Jimmy and Annie I took pictures of the inside but there's more I didn't take it all.1983. Deanna Durbin Paper Doll Book This is a copy of the 1940 book of this Universal star. There are 8 pages of clothes. This book is uncut and it is in very good condition. Winning bid pays 3.75 p/h. More outside the US. I will combine wins to save you on postage. Thanks for looking. Katy Keene Paper Dolls Here's one of those great comic book paper doll pages of Katy Keene by Bill Woggon. This is 1 page Debby’s Diary Fashions, probably from the late 50's or early 60's. Except for a little edge wear, it's in good condition. Winning bid pays 1.95 p/h. More outside the US. I will combine wins to save you on postage, just request a combined total invoice or throw everything into the shopping cart, commit to buy and I will send you an adjusted shipping invoice. Thanks for looking. Katy Keene Paper Dolls Here's one of those great comic book paper doll pages of Katy Keene by Bill Woggon. This is a 2 page Gigi & Curly Cowboy/Girl Fashions, probably from the late 50's or early 60's. Except for a little edge wear, it's in good condition. Winning bid pays 1.95 p/h. More outside the US. I will combine wins to save you on postage, just request a combined total invoice or throw everything into the shopping cart, commit to buy and I will send you an adjusted shipping invoice. Thanks for looking. We are the Estate Sale Warehouse. Has 2 dolls, punch-out holder, & 8 pgs clothes = 14 outfits. dolls punch out from cover & clothes must be cut out by hand. Keep checking back! In a labor of love and appreciation, Karen Prince has brought to life her vision of Blondinette and her enchanting trousseau. Blondinette Davranches Paper Doll. This is the age of Blondinette Davranches. Joan’s Wedding Paper Doll Book This is a copy of the 1942 book published by Whitman. There are 6 pages of clothes and 1 page of flower props. This book is uncut and it is in very good condition. Winning bid pays 3.75 p/h. More outside the US. I will combine wins to save you on postage. Thanks for looking. Phyllis McGuire Paper Doll Book This lovely paper doll book was published by the Paper Studio Press in 2009. The artist David Wolfe did the artwork for this book. There are 8 pages of clothes for this singing star from the famous trio, Phyllis McGuire. This book is uncut and it is in very good condition. Winning bid pays 3.50 p/h. More outside the US. I will combine wins to save you on postage. Thanks for looking. 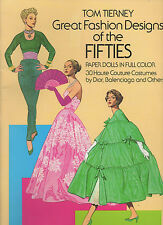 This is the RARE UNCUT FASHION CUT OUTS paper doll book. It was published by Lowe. Although undated, it is based on another Lowe book that was published in 1945. COMPLETE & NOT A REPRODUCTION. There are 6 pages of uncut clothes. Doll punches out from cover & clothes must be cut out by hand. Has 1 doll, punch-out toys, & 8 pgs clothes = 16 outfits. 12" doll and 12 colored fashions. New and sealed. THIS IS A ORIGINAL UNCUT BOOK. IT IS A DIE CUT BOOK. THE WHOLE BOOK IS SHOWN. This paper doll is based on the popular Crissy fashion doll that was made by the Ideal Toy Corp. in the 1960s & 70s. 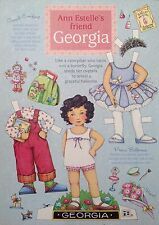 This is an UNCUT CRISSY paper doll book. It was made by Whitman in 1973. The book is COMPLETE & NOT a REPRODUCTION.